Every year, 12,500 people survive spinal cord injuries. The prognosis varies greatly, from complete spontaneous recovery to little to no progress even after years of treatment. There are many factors which can impact an individual’s prognosis. And while it’s true that some injury circumstances are uncontrollable, studies have shown that prompt, quality care can make a major difference. The sad truth is that many local hospitals are poorly equipped to meet the needs of traumatic brain and spinal cord injury patients, and even the best doctors and surgeons may have gaps in their knowledge. It’s important to do your due diligence to find the best doctors and facilities in your area. 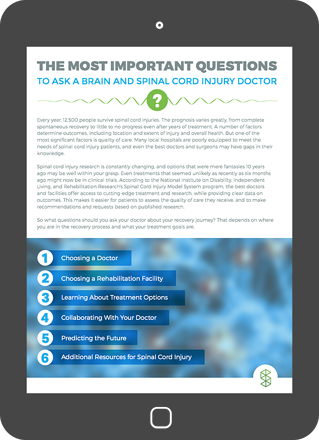 This comprehensive guide will walk you through all of the most important questions that you should ask yourself and your potential provider when assessing a new traumatic brain or spinal cord injury doctor. Fill out the form to receive your free copy of the list.